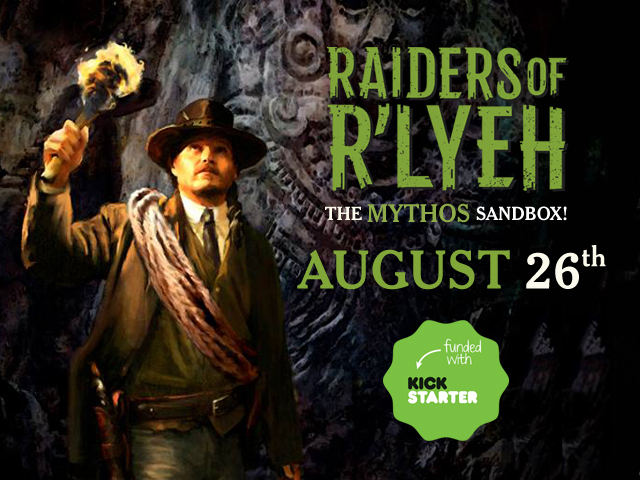 A guest article discussing “Sandboxing the Mythos” in Raiders of R’lyeh: http://raidersofrlyeh.com/cthulhu-osr/. The design journal will cover more of this territory in the next couple weeks, including —hopefully — another guest article. By the way, our first podcast episode was released to our mailing list, which included: an interview with entertainment artist Cliff Cramp; a discussion about “concept designing” the world of Raiders of R’lyeh; his thoughts about the current state of the entertainment industry and the role of Kickstarter; and, a walkthrough of designing and illustrating specific archetypes. I’ll be posting the podcast here as soon as I get that feed set up, most likely this week. I read this with great interest as I attempted to do something heading towards a sandbox with my Cthulhu Invictus campaign--the opening scenario was pretty well set but in due course the investigators were more or less presented with a territory in which there were several sets of bad guys and had to decide which, if any, they were going to take on and in what order. That 'if any' was the sticking point as they were busy instituting a 'meek and mild mannered investigator dry gulches a bad guy preferably when he least expects it, and the only pity is that a call of nature isn't involved,' style of play. I came to the conclusion that the sandbox has to be well, well stocked, and the geographical area large enough to plausibly contain everything. But I find the idea described in the article fascinating--good luck with it. If you've got access to the BBC you can listen to this podcast. It's a reading of the book 1913, looking at what was going to change. I've moved the Sandbox discussion to its own thread. It has much wider applicability than Raiders of R'lyeh. I posted this audio interview with artist Cliff Cramp to our mailing list a week ago, but forgot to post here (until now!). In this phone interview, Cliff discusses his background, influences, involvement on Raiders of R'lyeh, development of specific Archetypes in the game, and insights about being an illustrator in today's market. Qbauer, do you think you could put up a couple of downloadable banners in various sizes on the site for people to place on their blogs or forums? Hope these work for you! I'd hope they work for others as well . These will do just fine. I'm mainly interested in the system, as it stands, although the 1910 era looks like it could make an interesting variation. The RQ based mechanics are very clean and easy though, from other games I know, and it may become the system of choice in the light of 7e (which I honestly feel are a little clunky looking). I feel there are many reasons that will make this a very interesting release for lots of Mythos fans: the excellent artwork, the new era and setting to play in, the sandbox angle, the new rules system. Qbauer, I recommend you guys have a look at the Renaissance system from Cakebread & Walton for this as well, but you probably already have. You can count me in as well! I'll have to add though, that if the stretch goal for a print version isn't met I'm out. I aim to at least get a nice hardcover book out of it. Thanks for the support, guys. We are all praying that everyone keeps their shorts (or doesn't eat them, or whatever shorts-related metaphor applies here). Cakebread & Walton is on our radar, definitely. We are roughly 7 hours away from launch (which is midnight my time, Pacific Standard Time). As I am not yet completely clear on the exact overlap and differences between the two different rulebooks (Adventurer Guide and Raiders of R'lyeh in Gothic Black & White), I'll pledge 5 dollars to start with and up my pledge later. I'll take any questions I have to Kickstarter. @christian We'll work with you as to what you would prefer; if you want a full color image (similar to the sample archetypes), then this is possible for both villains and heroes. Layout examples will be added in an update, and I'll try to address your question visually in those updates. You will also get an idea of hero and villain types in the updates, so you can tell us what kind of character you prefer. @HomoLupusDomesticus Thank you. We will be making some more updates during the launch to clarify these differences. Thank you for the support (it cannot be said enough)! @qbauer My main concern is, what content - including artwork, maps, props, NPCs, adventures - I may miss out on by getting the Keeper Guide and Adventurer Guide without Raiders of R'lyeh in Gothic Black and White. Without opening a Pandora's box (because we plan to add more details about this in future updates), the Gothic Black and White edition will contain a denser set of sandbox toolkits, including dozens of adventure modules. Think of an adventure module as an expanded scenario with toolkits for playing in a region of the world, or focused on a specific type of threat. We have adventure modules taking place in the Arabian Desert, another one in Manchuria five years after the Russo-Japanese War, another one in Afghanistan, and so on. Some of the adventure modules are designed more for investigator types, while others are geared toward adventurers seeking problems in far corners of the world. These put you in the time and place and involve a broad collection of NPCs, weapons, and politics particular to a region (as well as potential entanglements with the mythos). For example, the Arabian Desert module contains resources for whipping up Bedouin, German cavalry, Turkish infantry patrols, local archaeologists and explorers, local curators, mercenaries from all over operating in and around Aleppo and Damascus, and the weapons and equipment one would find in the area; plot seeds are provided for a central threat and its web of conspiracies; suggestions for factions are offered so that the module may be connected with a larger tapestry of politics and sorcerous plots, as well as plugged into other modules. If one needs to roll up an NPC (like a Chechen mercenary, or a Bedouin chieftan), we attach toolkits for rolling up names from a multitude of cultures and regions. Now, to get to your question...the Keeper book contains several of these adventure modules, plus traditional scenarios for people who donâ€™t want a sandbox, necessarily, but rather just a sourcebook for playing in the pre-War era. The Black and White book contains dozens of these modules, and includes more of these toolkits (such as name rosters for different corners and cultures of the world). There is more, but this is a huge portion of what differentiates the focus of each book. Hope that answers your question. But, like I said, there is more coming in our updates. @qbauer Thanks for your thorough answer. For now, I'll just add a pdf of the black and white RoR book to my pledge and keep an eye on further developments. Like I said, I will ask any other questions I may have on the Kickstarter site instead of here. Please do, as others may have similar questions. And thank you so much for the support. Next up, I'd love to get you guys in on the play test document. I will be getting news out about the document soon. It's taking longer than expected because we wanted to put more into it (including an adventure template that really shows how this game is different than CoC and other mythos games).